Let's travel back to the 1930s with the Carne sisters in The Brontes Went to Woolworths by Rachel Ferguson. Deirdre, the journalist, Katrine, the actress, and little Sheil live with their mother in London. They live a crazy, imaginative existence where their doll lives in Paris, their dog was once the Pope and a famous clown is their neighbour. It's so hard to figure out at first. What the heck is going on? Who is real? Who is pretend? Once I sorted out the shenanigans, I became very attached to this bunch of wackadoos. The only stick in the mud is the governess, homesick Miss Martin. She doesn't approve of Katrine's fraternizing with actors or the family's current obsession with Judge Toddington, or Toddy as they call him. She can't figure out what's going on either. It made me feel sorry for her. She's a huge pain in the rear but it would be hell always being the one out of the joke. Deirdre has an opportunity to meet the real Toddy's wife and she gets nervous. How will reality compare to the fantasy? And how can she keep from scaring the poor woman to death? I'd love the live in the Carne sisters' world for a little while. They're mad as hatters but they have a great time. It's quirky and whimsical. Even when they have disappointments, their fantasy world helps them overcome them. I enjoyed the pre-war era setting but didn't appreciate some of the snobbishness displayed by the family. Most of the book is told from Deirdre's point of view in the first person. Occasionally the point of view would shift to Miss Martin. I sort of understand why but I found it disjointed. Overall I thought it was cute and enjoyed it. And what's with that title? 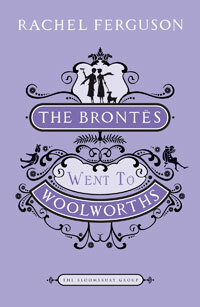 Well, the family goes to Bronte country and something unusual (even for them) happens. Thanks to BiblioSue for sending this to me. Since I read this for Nymeth's 1930s Mini- Challenge, I thought I'd post a photo from the 30s. This is my Grandparents' wedding in 1934. They were farmers so it was nothing fancy. 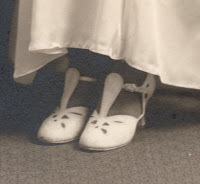 But look at my Grandmother's shoes! this sounds like fun. I'm reading a 30s book for Persephone week right now and then I have another on my line up. I think Nymeth got it just right: perfect time for a 30s mini-challenge! The book sounds delightful! I love characters that are "mad as hatters!" This book sounds like lots of fun. Thanks for recommending it! sounds like i'd be out of my mind trying to keep up with the shenanigans in this one! 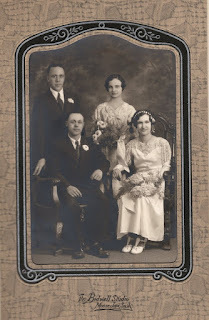 i did love the photo you included--made me wish i had a wedding picture of my grandparents. :( they got married in the 30s at niagara falls. What lovely pictures! I love the shoes, too :-) And I really need to read one of these Bloomsbury Group books. These covers by the Bloomsbury Group look great and if your review hadn't convinced me, I might just have picked it up because of the cover. The book sounds great and the pictures of the 30s are lovely. Rebecca- I hope to find more books from the 30's. Suzanne- They were all a bit bonkers. Nat- What a nice spot to get married! Aarti- Yes, I must see if I can get the rest of them. Iris- The cover is gorgeous. I love the purple.